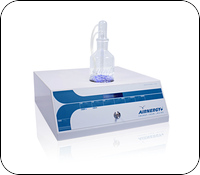 The Airnergy therapy device is a portable, compact machine for use in the home and clinic that creates ‘energised air’ that feeds every cell in your body with oxygen that it can absorb and use more efficiently. 75% of inhaled oxygen in the air is exhaled again unused. Without water or food human beings can survive for days or even weeks, but without air just a few minutes. In 24 hours every person breathes some 400 litres of oxygen at rest and, during physical exercise, considerably more. Humans thus make relatively poor use of respiratory air. Of the 21% of oxygen contained in respiratory air, the human body can only use around 25% of this. 75% is exhaled again unused – one reason why mouth-to-mouth resuscitation is possible. And above all: The weaker or older you are, the less oxygen the body utilises. In the AIRNERGY device the oxygen in the air is continuously returned to its energy-rich state (singlet oxygen) – the physiologically active form of oxygen that the body recognises. This enables a patent-protected process to take place, which reproduces photosynthesis found in nature. The short-lived singlet oxygen returns to its original state in a fraction of a millisecond, releasing airnergy. The water molecules in the respiratory air take on this energy, which is then inhaled through a comfortably fitting nasal cannula together with normal respiratory air.